This September, we had an occasion to ride around Tokyo for half a day with Dr.Lim Seh Guan, from Penang,　Malaysia. Dr. Lim is the chairman of G Club Penang Cyclists, a very active cycling club in Penang. They organise monthly rides to encourage people to cycle and we are also were the organiser for the PENANG ROUND ISLAND CAMPAIGN FOR A LANE event, attracting 3066 cyclists this year. Naturally, a very good cyclist Lim-san was, on his first "Mama-chari" ! Tsukiji- Fish Market was very crowded being a Saturday (Tsukiji on Sundays are very quite), and business was lively. After a beautiful open view of the Tokyo Bay from Toyomi Pier, we headed for Tsukuda-Jima to feel the old Tokyo atmosphere, then headed north along the river to Ryogoku. fortunate to meet several Sumo wrestlers entering the Ryogoku Stadium. 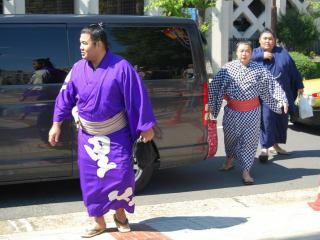 Yes, you can meet Sumo wrestlers live, if you're there at the right timing. A short half day ride, but a good and fun one with Lim-san. And the weather was just perfect too ! Even just half a day on the bicycle will add a very good experience to your trip to Tokyo. I think it did for Lim-san. Don't forget the G Club Penang Cyclists when you go to Malaysia. They do guided rides too. This page contains a single entry from the blog posted on October 15, 2011 11:41 PM. The previous post in this blog was Bike shops you should visit in Tokyo. The next post in this blog is BIke Ride 10-Dec-2011.